The presidential elections started out bad, then got worse. One hate-infused promise spewed from the mouth of Donald Trump - "I'm going to build a wall between Mexico and the USA" - is now causing chaos in classrooms across the country. The Republican party is in shambles trying to deal with the Trump train. The fallout is hitting classrooms like a meteor shower. Traditionally, previous presidential elections were teachable moments for third, fourth, and fifth grade civic lessons. Not this one. Teachers are afraid to even talk about the presidential campaign with their students for fear of losing control or getting an email from a parent accusing them of talking politics. Teachers say that it's the scathing rhetoric that worries them. According to a new report from the nonprofit Southern Poverty Law Center’s Teaching Tolerance project, the primaries are having a negative effect on students. 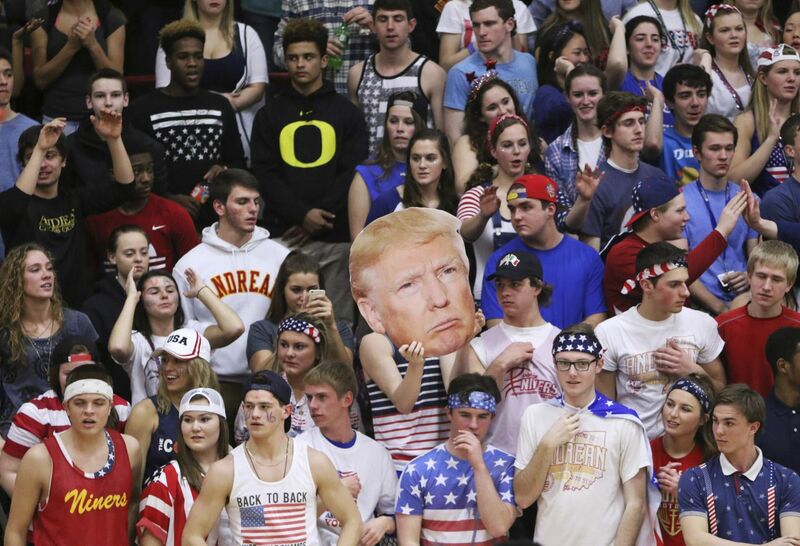 Recent reports of Indiana high schoolers chanting “Build a wall!” during a basketball game against a largely Hispanic team, or third graders in Virginia warning their “immigrant” classmates that they’ll be sent home when Trump is elected, are the kind of things traceable to the hate rhetoric rolling off of Trump's (and Cruz to a less degree) tongue. While the report finds that “children of color, in particular, are being deeply traumatized,” other students appear to be “emboldened by the divisive, often juvenile rhetoric” heard on the campaign trail. More than a third of teachers reported hearing an increase in anti-Muslim or anti-immigrant comments, and more than half say their students have become increasingly unable to engage in civil political discourse. Never has there been a more devisive presidential primary than this one. If Trump becomes the GOP nominee the fissues that he's caused thus far in our society will become ravines. Worse yet, if Trump is elected president, we can expect a regime that will destroy the very foundation of Democracy and everything this country stands for.